Let them eat cake! We're sure this cake inspired Marie Antoinette's famous saying (or not)! White cake with cream cheese buttercream, dripped with pink chocolate, topped with handmade macarons, mint sprinkle pareils, and gold sprinkles. 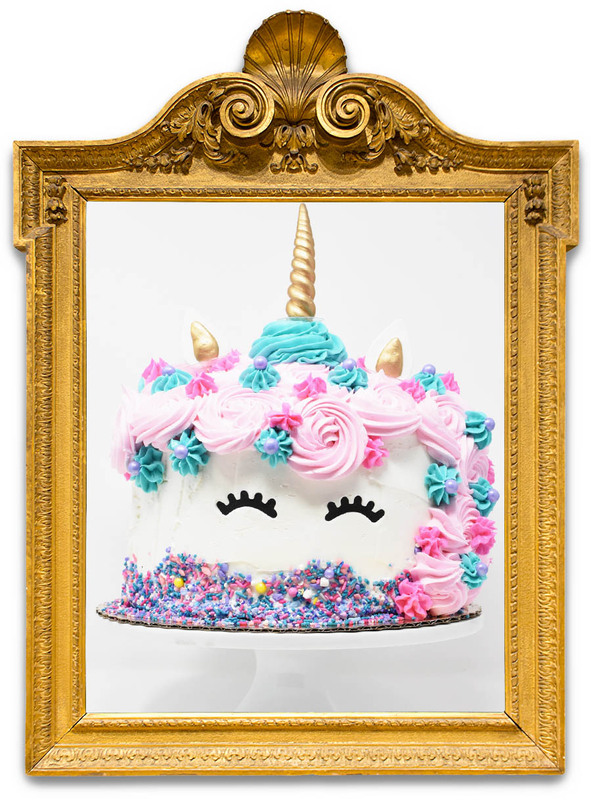 A unicorn can only dream of a cake this good! White cake with pink buttercream, dripped with white chocolate, with every girlie candy imaginable on top, frosted animal cookies, pink vanilla wafers, and pink sprinkle chocolate bark. A cute white cake or tuxedo decorated with pink rosettes buttercream, sprinkles, and an adorable face and ears that says eat me! A chocolate explosion with gold decadence and hazelnut chocolates, chocolate twills, chocolate kisses, chocolate pretzels, and chocolate swirl bark with gold glitter and sixlets. A tasty cake for spring and summer! White cake with layers of pink lemonade filling and cake and decorated with pink lemonade flavored buttercream, sprinkles, and candy lemon slices.